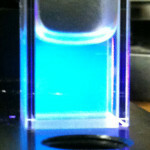 NOM Blue & Blue/Green Quantum Dots provide narrow band fluorescent emission at wavelengths ranging from 420 nm to 520 nm. The Blue Quantum Dots have a CdS core and a ZnS shell while the Blue/Green quantum Dots have a CdSSe alloy core with a ZnS shell. Choose desired weight and wavelength below. NOM Blue & Blue/Green Quantum Dots provide narrow band fluorescent emission at wavelengths ranging from 420 nm to 520 nm. The Blue Quantum Dots have a CdS core and a ZnS shell while the Blue/Green quantum Dots have a CdSSe alloy core with a ZnS shell. These core/shell complexes provide higher levels of photoluminescence and stability when compared to core only complexes. Our standard, organic soluble, quantum dots are surface coated with organic surfactants that make them lipophilic and soluble in organic solvents such as toluene, chloroform, and hexane. Prices start at $165 for 10 mg (minimum order); Available from inventory in quantities of 10 mg, 25 mg, 50 mg and 100mg. 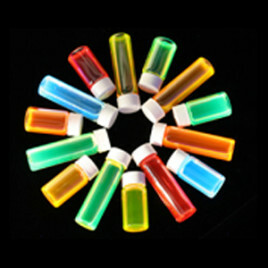 The following organic soluble CdS/ZnS and CdSSe/ZnS core/shell Quantum Dots are in stock. You may click links to see specifications and spectra. We encourage you to Contact Us for questions or special requirements. NOM Visible Quantum Dots have narrow band fluorescent emission wavelengths ranging from 540 nm to 680 nm. They may be ordered in weights of 10, 25, 50, and 100 mg or in kits of 3 containing 10 or 25 mg of any three different visible wavelengths. For kit purchase, specify the three wavelengths desired in the comments section of the checkout page.